Background: Smoking is a major health-related problem in Jordan due to which an effective smoking cessation program is needed. Lung Age which emphasizes the concept of a premature aging of the lungs, is a simple notion that smokers can grasp. Employing reference lung age equations can help health care providers convince smokers to quit. 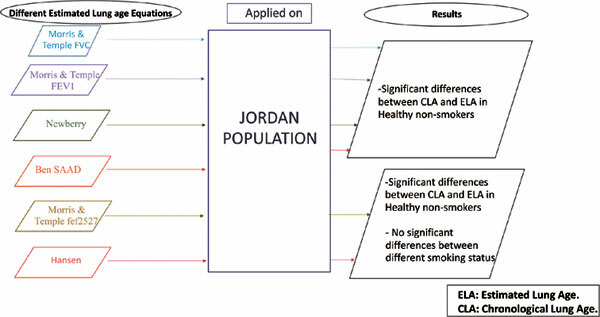 In this study the applicability of reference equations was assessed in estimating lung age for the Jordanian population, to aid smoking cessation. Methods: Adult Jordanians were recruited from Al-Zaytoonah University of Jordan and from several community pharmacies, polyclinics and hospitals located in different areas in Jordan. Overall, 1767 participants of both genders from different age groups were recruited to evaluate the applicability of different reference lung equations for the Estimated Lung Age (ELA). SPSS was used to conduct all statistical analysis. Results: A paired t-test showed a significant difference (p<0.05) between the Chronological Lung Age (CLA) and the ELA among the non-smokers. Similarly, some reference equations including Hansen and Morris and Temple FEF25-75 equations failed to show significant differences in ELACLA between different smoking status groups for women. Conclusions: Our results suggest that the current lung age equations are not reliable in predicting lung age among the Jordanian population, and thus cannot be used in smoking cessation programs. Chronological lung age, estimated lung age, Jordan, Middle East, respiratory health, smoking cessation, spirometry, water pipe smoking.